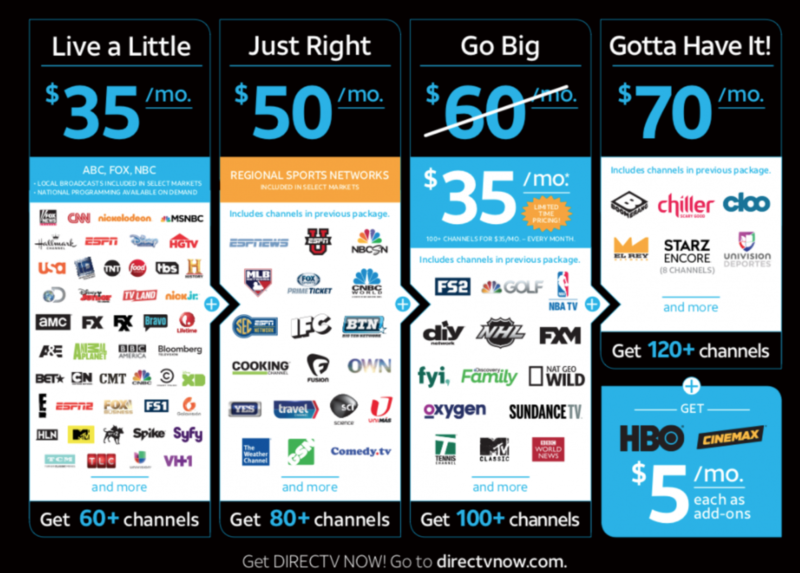 DirecTV has launched its over the top cord cutting service, DirecTV Now, enabling the ability to watch live TV over your internet service without the need for a cable set top box. This has the making of the catalyst needed to finally spur more people to cut the cord. A potential disrupter. What makes it different from the other services, and a potential disrupter, is not the ability to watch TV on multiple devices including internet ready televisions, laptops, tablets, phones and computers... other services such as Hulu also do. The disruptive feature is AT&T's vast infrastructure that allows them to offer a zero limit on wireless data when it is used for watching DirectV Now programming. AppleTV, Google’s Chromecast, Amazon’s FireTV, and most web browsers. As part of the launch, the company will give a free AppleTV if you sign up for 3 months; one month will give you a FireTV stick. Roku support is planned for next year. For ABC, CBS, Fox and NBC networks: "Yes/VoD" means available live in certain cities or on-demand 24 hours after airing in some cities.